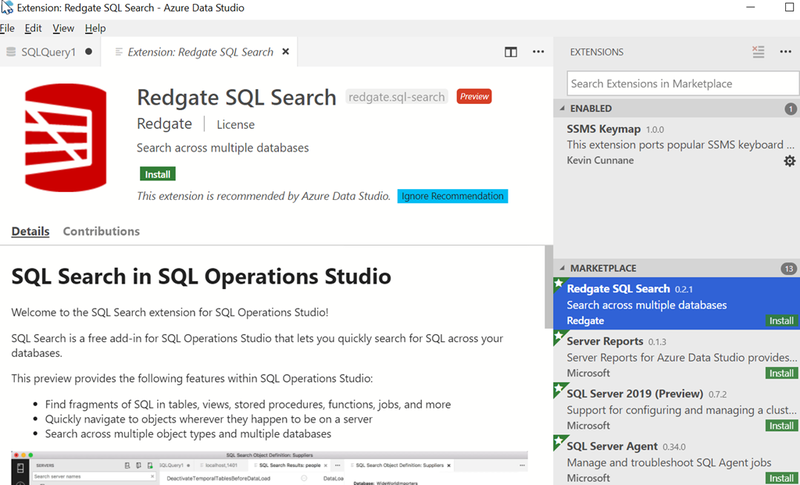 There are a limited number of extensions available for Azure Data Studio (ADS), but one that came out early is SQL Search. This is highlighted as a recommended extension from Microsoft. Redgate worked with them early on in the lifecycle of the product to get this extension working, including helping spec out the APIs for interaction with ADS. My extensions pane is on the right, so my details are on the left. 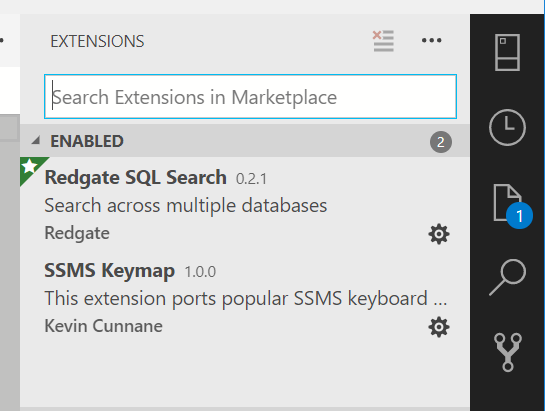 There’s a description of SQL Search as well as a link to install the extension. As with most extensions, the link takes you to a download page. 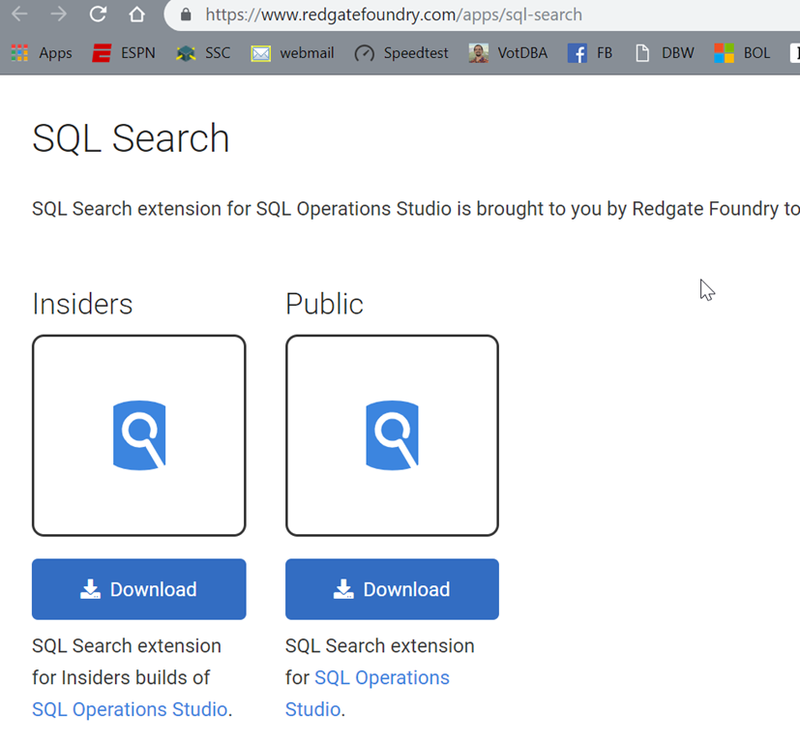 For SQL Search, this is a Redgate Foundry page with a few builds. I picked the public one. Installing extensions is basically using File | Install Extensions from VSIX and picking the downloaded file. You need to approve the extension and then reload once it’s installed. You can see it installed if you re-open the extensions pane. To use this extension, you can use the CTRL+Shift+P command to bring up the command palette. When you do this, you get a way to run commands at the top of the ADS window. This is a handy tool that you will use often. 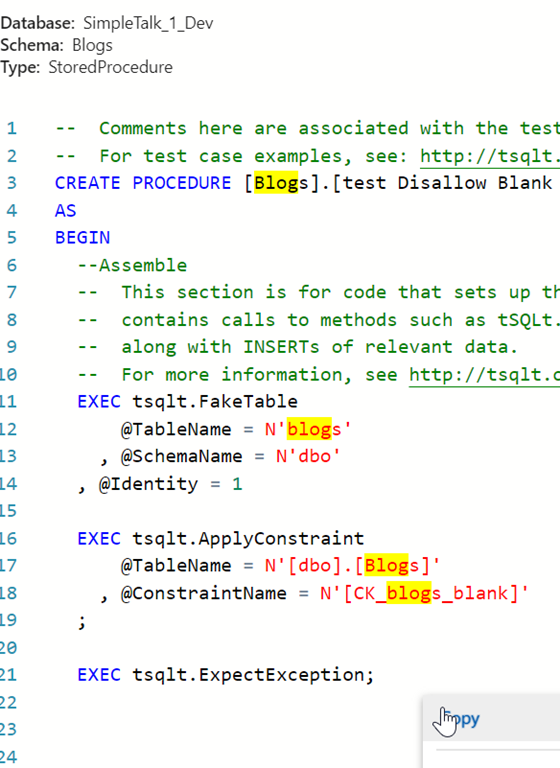 If we type “SQL S”, we’ll get the SQL Search commands. There is a reindex command and a search command. These are the two items implemented at this time. The re-index command will update the SQL Search index with information from the current database connection. If you cannot find an object you need, then you might run the reindex. The other command allows you to search the database. If we click this one, we get a new edit box at the top of the window. Focus will be in this window, so you can type a term. For me, I know there are a number of items in this database for blogs, so let’s enter that. The results will appear in a new tab alongside your currently open tabs. The results show me that I have an object name along with the schema and database. We see the type of the object and then the way the object was matched. Next to the object name, there is a circle with an ellipsis. If we click this, we have a couple of choices for what to do with our results. We can highlight this object in our object explorer, which will, well, do nothing for me. I suspect that the call from the extension to the servers Object Explorer is flaky. 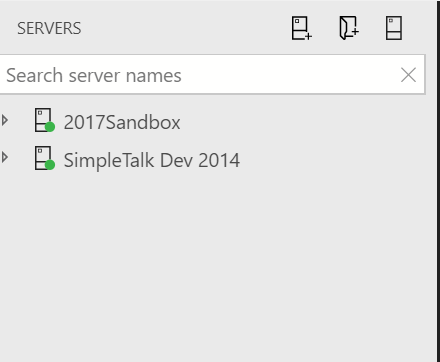 Even if I open the Servers pane and then click “Reveal in Object Explorer”, nothing happens. I see whatever I had opened in the Servers Pane. If I close the server pane and instead click View Definition, I get a split pane on the right with the object definition. I can resize this as needed, but this is a view only pane. I can’t edit or execute this code. It’s for reference, which can be helpful when coding, but is of limited use. I can copy this code for another window if I click the start and end places in the search results while holding the Shift key. Then I right click in the window and select Copy. 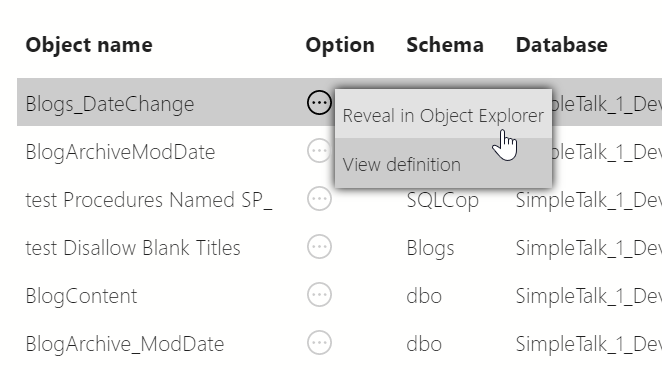 This is a limited use extension, but it does allow one to find code quicker than browsing through the Object Explorer. We can keep the search results up as a separate pane, so that we can use this as a pick list if we were looking for all the dependent objects for an object. One nice touch from ADS is that if you CTRL+Shift+P again, the SQL Search commands appear at the top as recently used items. 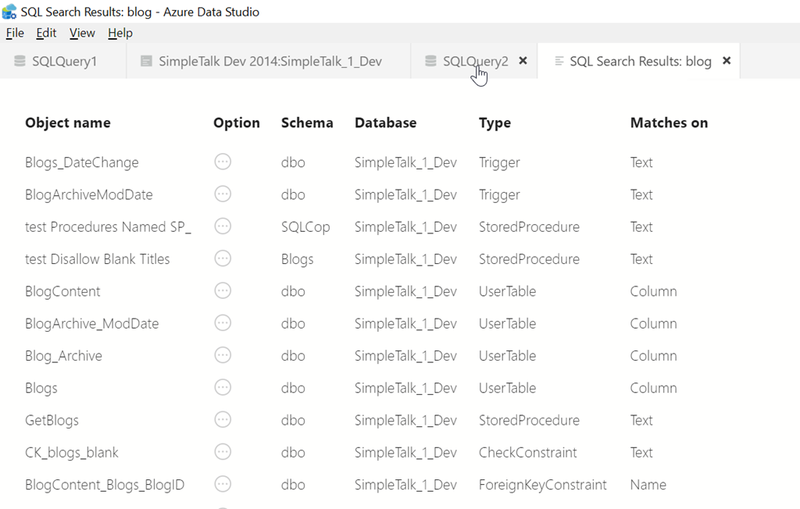 Give SQL Search a try and let us know what you think. This entry was posted in Blog and tagged ADS, Redgate, SQL Search, syndicated, tools. Bookmark the permalink.